Nashville Fashion Week is excited to announce a week full of special shopping events April 3-8 at a variety of Nashville-area retailers city-wide. Shop Nashville is a city-wide celebration designed to encourage and support the local retail community that makes us uniquely Nashville. Thirty participating retail partners will host seventy-nine of their own events, trunk shows and unique promotions during Nashville Fashion Week to benefit the Nashville Fashion Forward Fund of the Community Foundation of Middle Tennessee through donations and proceeds from event sales. NFW Sponsor Legacy Ink has donated a limited quantity of official "Shop Nashville" tote bags for each participating retailer to gift to their customers during the week. Present your receipt for at least $25 from any participating NFW “Shop Nashville” retail partner for free admission to our Nashville Fashion Week “Evening of Photography + Fashion” event at Fifth Avenue of the Arts on Thursday, April 6 from 6:30-9:30. • Any Old Iron, Levy’s, Lily Guilder Design Showroom, Posh and Stacey Rhodes Boutique will each host NFW runway designer trunk shows. 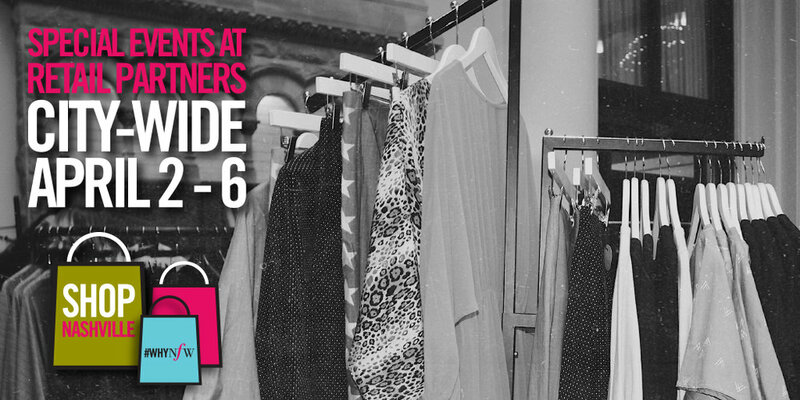 Stop by to shop the looks from the runway and meet the designers. • Alabama Chanin designer and Nashville Fashion Forward Gala guest speaker Natalie Chanin will showcase her collection at Steluta all week long with a meet and greet on Friday. • Kick off NFW shopping at UAL, a seven year NFW sponsor, with 20% off any single item purchased at any of their three Nashville locations on Monday, April 3. • Trunk Shows at Emerson Grace, H. Audrey, Levy’s, Oak Hall, Private Edition and Two Old Hippies throughout the week. Margaret Ellis Jewelry is hosting an out-of-studio trunk show at Nina Kuzina Gallery on Friday and Saturday. Visit NashvilleFashionWeek.com to view the full Nashville Fashion Week 2017 schedule including detailed event descriptions for each of Shop Nashville's participating retailers and to purchase tickets to all of the official NFW events planned throughout the week. LAST CALL TO SAVE - TICKET PRICES INCREASE TOMORROW! Individual runway show ticket prices will increase $25 each and tickets for Thursday's "An Evening of Photography + Fashion" ticket will increase $15 on Tuesday, March 28 so get your tickets now! It's only one more week until show time!